And here’s Hotaru’s short story to celebrate the release of his CD. These all have such sad vibes :’)) but at least they have such fateful meetings with their heroines in their CDs. I translated these a little out of order but I feel like there’s more connection and understanding of his character after his main CD. Anyway, this entire series was a fun side project and I hope you all enjoyed it. 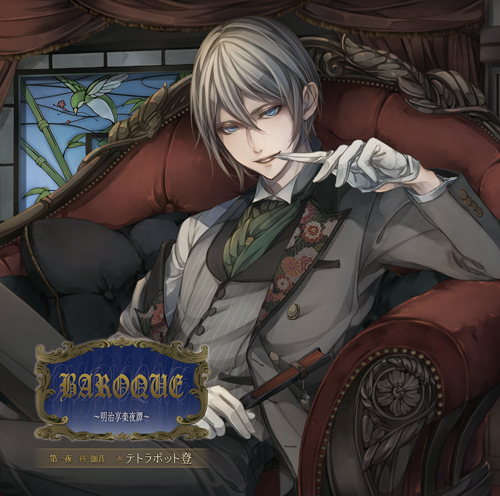 This entry was posted in Baroque, Drama CDs. You were married into a distinguished family as the second daughter of a prosperous mercantile house but then arbitrarily divorced by your husband, who was surrounded by mistresses, and so you returned to your parents’ house. What awaited you there were days of rude treatment from your family for being a disgrace. 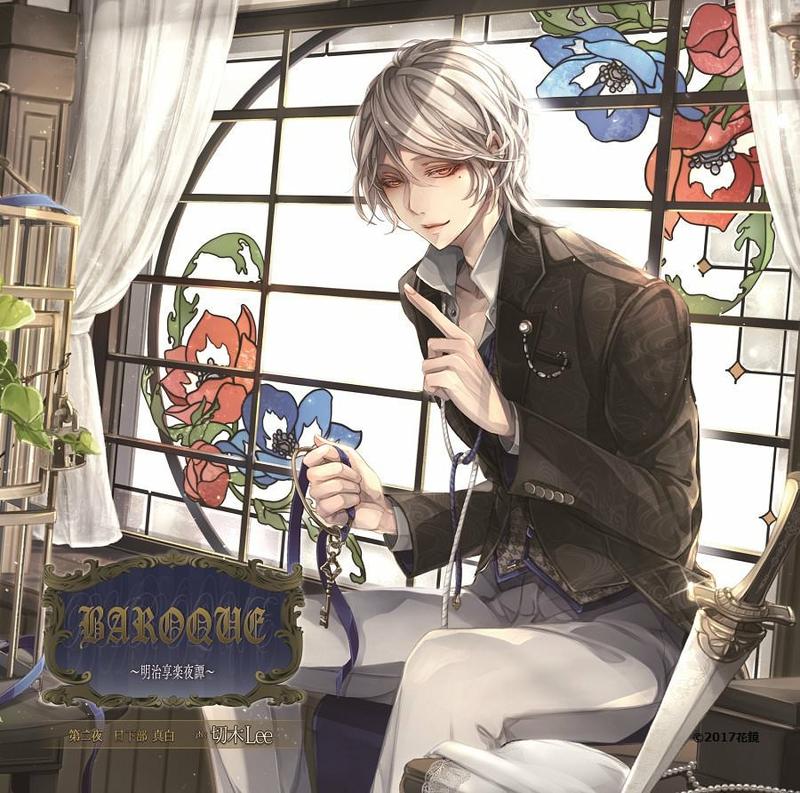 You knocked on the doors to Baroque to fill your loneliness and there you met the male courtesan, Nagumo Hotaru, and the Western doll he was in possession of, named Kosuzu. Although a little confused by Hotaru who declared that while he was a male courtesan there was a line he wouldn’t cross with customers, you chose to spend a night together. As he said, Hotaru serviced you with his hands and lips but would not embrace you in the last step; however, you were healed by the innocent side that Hotaru showed occasionally, and so you went to Baroque many times. One night, when you asked with slight curiosity as to why he wouldn’t sleep with customers, Hotaru replied with puzzling words that he could only love the doll, Kosuzu. Unable to understand the true meaning behind those words, eventually Hotaru collapsed from an illness–. This entry was posted in Baroque, Drama CDs and tagged Abe Atsushi, Hanakagami, R18, Vol.3. 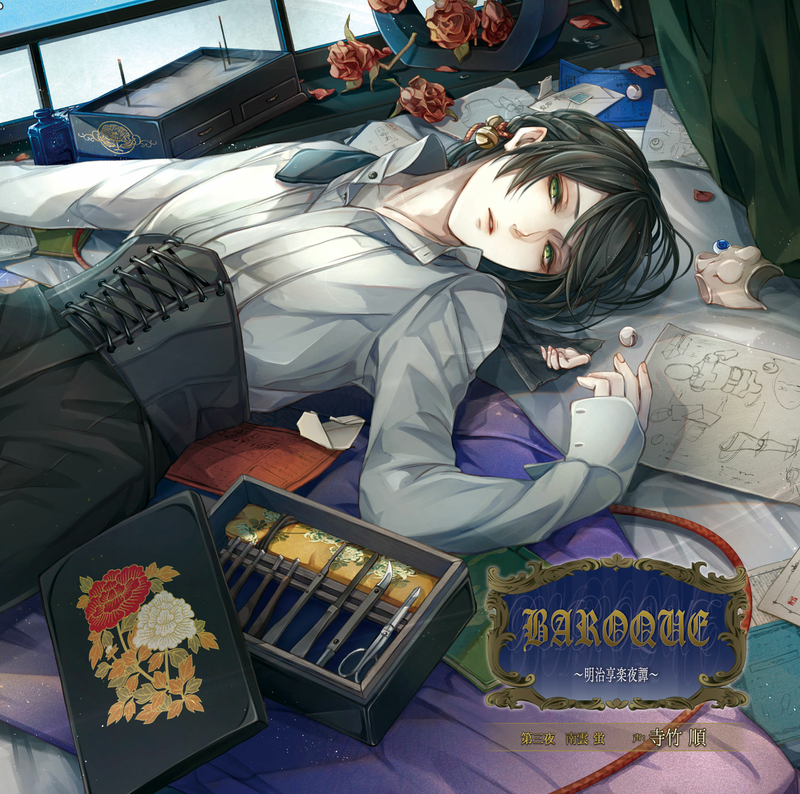 I realized that Mikado-sensei wrote two short stories for Baroque to celebrate the release of their CDs. Funnily, there’s only one for Mashiro and then one for Hotaru LOL so Kain got left out, although he does feature in this one. Anyway, I figure I’d treat you guys to her prose and translate the short stories since I admire her writing greatly. An earl’s daughter, you were returning home after slipping out secretly from an evening party but, caught by a sudden downpour of rain, you took shelter under the eaves of Baroque, unbeknownst to you a high-end brothel of the capital. There you met a male courtesan possessing an uncommon appearance– it was Kusakabe Mashiro, who used to be employed at your mansion in the past. This coincidental reunion brought back to life the love you held towards him, but Mashiro refused you coldly. Several days later, unable to give up, you visited Baroque once again of your own volition. It was a rule of the male courtesans who worked at Baroque to be unable to refuse the wishes of a customer. Thus, a relationship was tied between you and Mashiro, but even though your bodies were connected your hearts were not, and the days passed repeatedly. This entry was posted in Baroque, Drama CDs and tagged Hanakagami, R18, Shingaki Tarusuke, Vol.2. You, a noble lady, spent your days in melancholy due to the existence of a fiancé determined by your parents. At that time, you heard rumors about the high-end brothel, Baroque, that existed at the edges of the capital. It was said everyone hid their identity there and freely enjoyed a night of passion. If you were to marry an unfamiliar partner like this then, at least once, with a person you chose yourself… That thought made you knock on the doors of Baroque. The one who greeted you was Hiiragi Kain, a male courtesan with a calm atmosphere. You were strongly drawn to the kind Kain and went to Baroque many times; Kain also reached out and established a bond with you. However, eventually the day you had to meet with your fiancé arrived. The one who awaited you at your fiancé’s mansion was a young man with cold eyes. And his face was exactly alike to Hiiragi Kain. This entry was posted in Baroque, Drama CDs and tagged Furukawa Makoto, Hanakagami, R18, Vol.1.